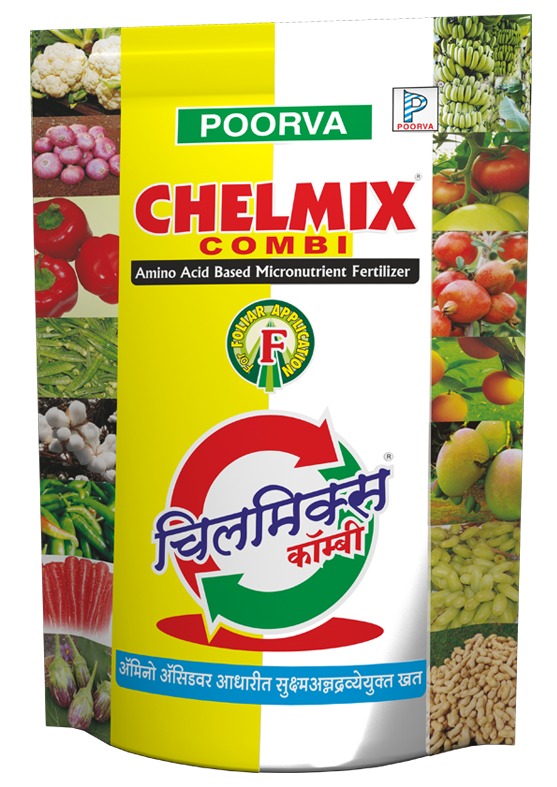 Chelmix contains the essential micro elements those are needed by plants. Micro elements are in fully chelated and in amino acid based form. Chelmix contains the essential micro elements those are needed by plants. Micro elements are in fully chelated and in amino acid based form. Micro elements are readily and 100% easily available. Chelmix Combi is 100% water soluble formulation. Chelmix Combi has quick action and result. When applied as a foliar spray, nutrients are immediately and readily assimilated and give fast results. Nutrients are quickly supplied to all sites within the plant. Corrects all deficiencies those occur due to non-availability of micro elements. 1 to 1.25g/Ltr of water.